​ does not diminish braking quality during first use. 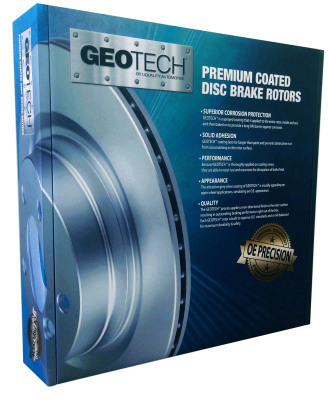 • GEOTECH™ allows rotors to be installed right out of the box. No pre-degreasing (dry protection) is necessary. of vent interiors and no oxidaton. ​ of OE and is much more appealing on today’s open wheel designs. ​ on rotors for all vehicle types. © 2017 All Rights Reserved. UQuality Automotive Products Corp.